The Ireland Golf clock is designed and handmade by Colm Mc Cann of Killyliss Studio. Ireland is blessed with over three hundred golf courses,The Old Head of kinsale, Royal Portrush,The Druids Glen and Enniscrone golf clubs are a few of the most famous courses. 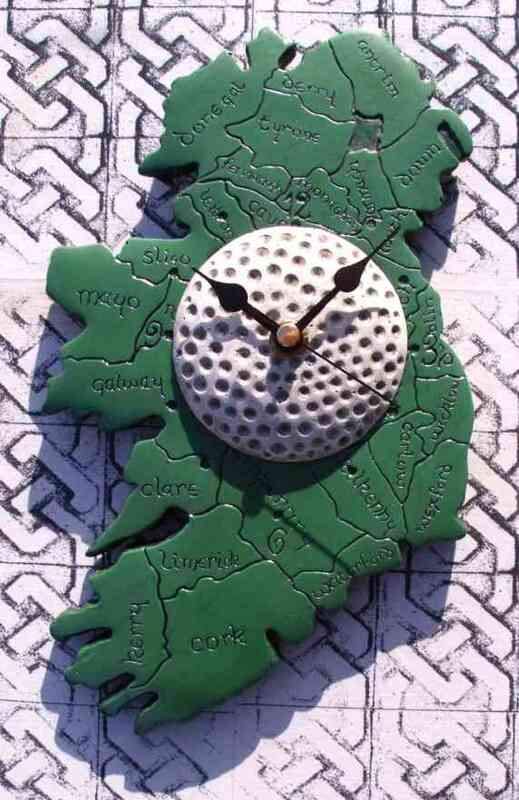 This wall hanging Irish golf clock features the shape of Ireland with the Irish counties are mapped onto it. The body of the clock is hand cast in green and the golf ball is hand cast in white. 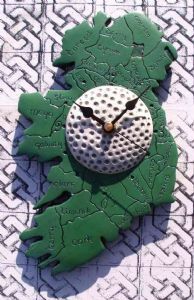 This clock makes an excellent Irish golf gift for anyone who has had a golfing holiday in Ireland , they can show their friends the county in which they played a round in. This Irish golf clock would be a great addition to any den wall and makes the perfect Irish golf trophy or retirement present. "May thy ball lie in green pastures... and not in still waters."